The nesting season usually begins in May and lasts for several months. 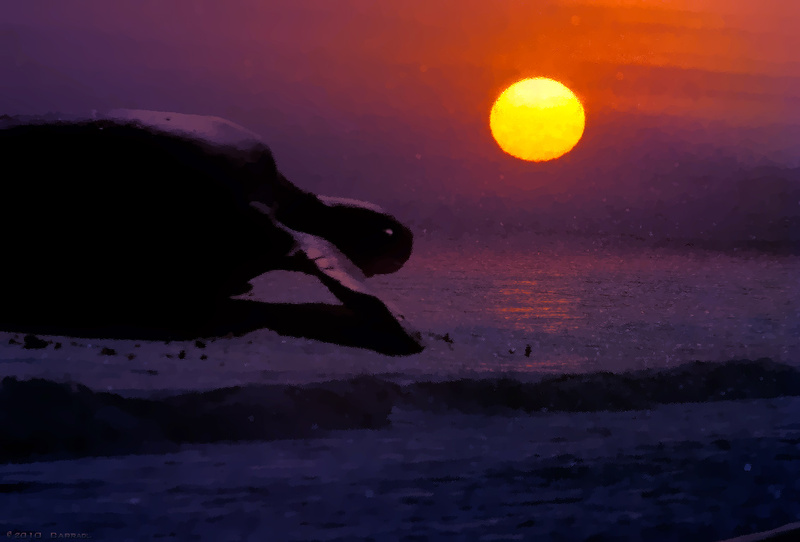 The turtles come to the beach in large numbers during the nighttime hours for 2-3 evenings after a full moon. They scoop out holes in the sand 2-feet deep, deposit their eggs and cover them up. At the peak of this activity, turtles number in the thousands. The eggs look like slimy Ping-Pong balls. Oh, this is ancient, extraordinary, a timeless window of wonder. The moon or sun ? lights up the sky. Have you participated in the release of the turtles to the sea? I did that in Puerto Villarta, and would like to do it again! The turtle looks so big. That is the most fantastic photo I've seen in a long time. I like it all the more because I love turtles of all sorts.